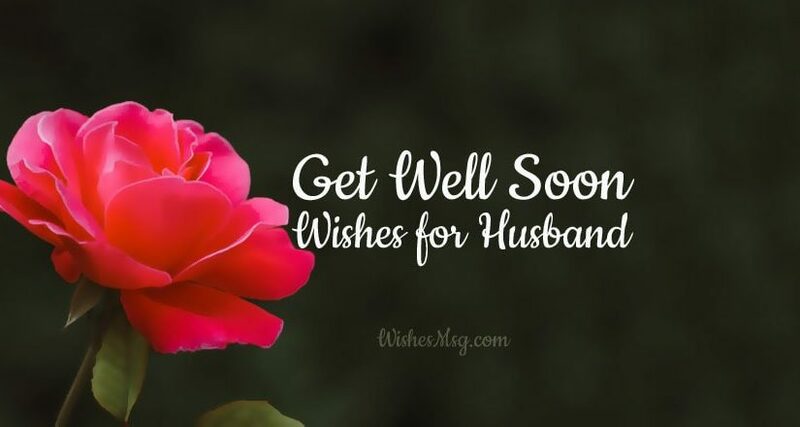 Get Well Soon Wishes for Husband : your husband is the closest person to you. Also, he is the person whom you love and care for most. You always want to see him fit and healthy. But sometimes, our dearest people fall sick. There are times in your life when your husband is not well. It doesn’t matter if he’s close to you or far away, in the home or in hospital, you can not have peace in your mind. In such times, you really need to wish your husband get well soon so he can feel good regardless of his physical condition. So, check these get well soon messages so you can pick the right one for your husband when times are hard. 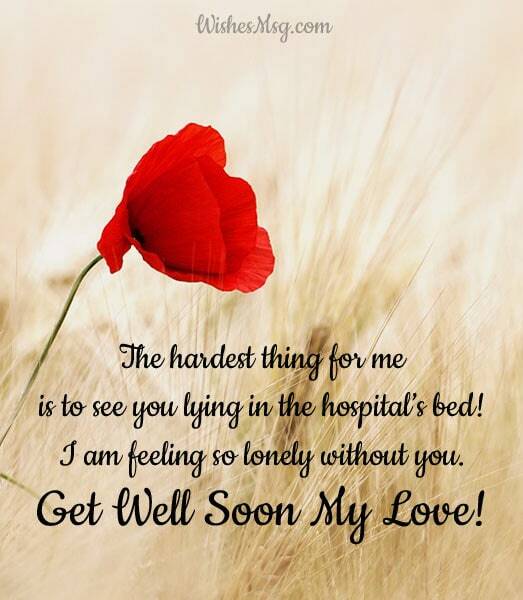 This is where you will find Heartfelt get well soon messages, romantic get well soon messages, funny get well soon messages and motivational get well soon messages. Happy reading! Without you every second is like a month for me. How you can be lying in the hospital bed without me! I cannot see you there. Please get well soon for me! The hardest thing for me is to see you lying in the hospital’s bed! I am feeling so lonely without you. Get well soon my love! At night, when I saw towards the sky I can see that the stars are not shining. I asked them what is the reason? They told me that the reason is your sickness! Get well soon my lovely hubby! I can feel your pain my dear! I miss your presence everywhere! Without you, the house has become empty. I miss you so badly. So get well soon and come back to me as early as possible my hubby! Sometimes we cannot understand the reason for being unwell. I could not even think how life will be without you for a few seconds. 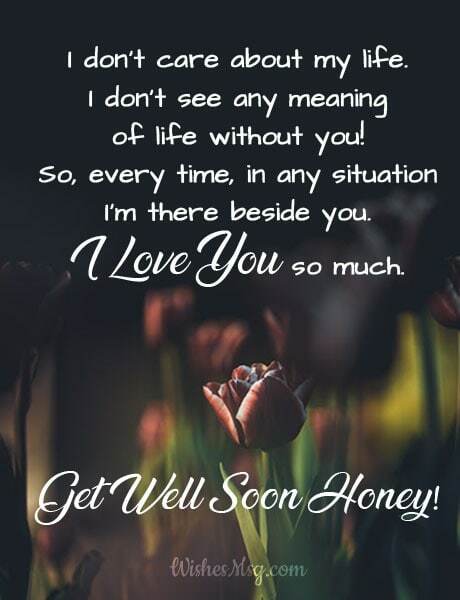 Get well soon honey! Without you I’m incomplete. Every night when I wake up I cannot see you at my side! It’s hurting me so my dear. Come back to me very soon. Praying for your fast recovery! Dear hubby, our love is stronger than any virus and bacteria. You need to stay strong and fight back hard. 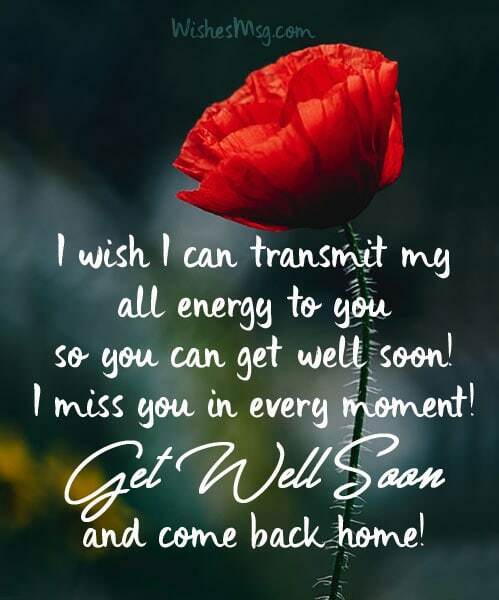 So my wishes and prayer for you get well soon dear! Waiting for you. Do you know the flowers in our garden are looking very unhappy? The birds have also stopped singing. It’s because of you! Why are you in the hospital? Come back soon among us. Wishing your fast recovery! Dear, I hope you are much better now than before. I cannot wait to see you at home! Get well soon my love! I love you! I don’t care about my life. I don’t see any meaning of life without you! So. every time, in any situation I’m there beside you. I love you so much. Get well soon honey! Though I’m physically well, but I’m mentally unwell because of your sickness! Honey, my everything misses you whole. Praying for your fast recovery my love come back soon! Sweetheart! Without you, everything is getting bored. It will be continued if you don’t get well soon. Wishing for your good health and fast recovery. Feeling unwell is normal dear! Keep one thing in mind that no germs, no bacteria can separate me from you when the entire world couldn’t separate us! Wishing for your fast recovery! What are you doing in the hospital for so long? Are there beautiful nurses? 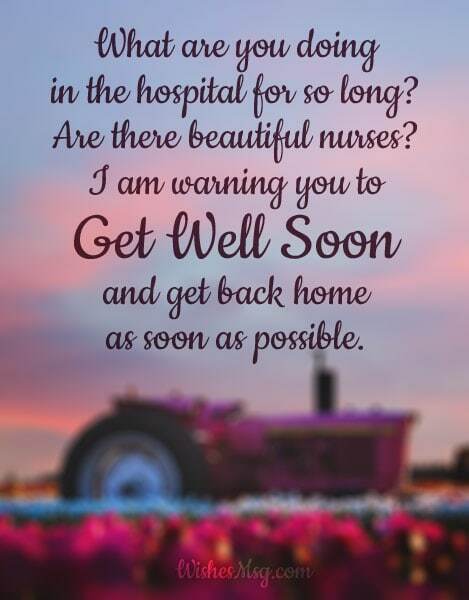 I’m warning you to get well soon and get back home as soon as possible. I wish if kisses and hugs are the medicine I were the source of your medicine my dear! But it never happened. So get well soon my love by taking proper medicine! If you come out from your sickness very soon I’ll give you a surprise gift. But it has a time limit. So, now it’s your choice that whether you want the gift or not. Get well soon my love. My love! I’m the queen of your house and you are the king. And without the king, queen become incomplete. So, come back soon beside the queen. Praying for your fast recovery dear! Though you are sick you looking cute in the hospital bed! Get back in our own bed so I can see you all the time. Get well soon my lovely hubby! Sickness is a chance of taking rest! Don’t be upset dear! I’m always with you all the time. Be brave! Get well soon please. My face will not get back its smile until you are in the hospital bed. You are my happiness, my love! All day I praying for you. Get well soon dear! Now it’s time for positive thoughts my love! You completed your treatment and it’s a great news for me. I wish I can see you at home soon. Wishing your speedy recovery! Sweetheart! Probably I cannot take care of your right now but I think the doctor will take great care of yours! We have submitted you to the top physician. So, Get well soon! I wish I can transmit my all energy to you so you can get well soon! I miss you in every moment, dear! Get well soon and come back home! Today when I saw towards the sky I saw a rainbow! It means something special has happened! Praying for your good health and speedy recovery my hubby! When people fall sick, they want their dearest people to stay beside them always. Get well soon messages are exactly what they need to keep their mind strong.